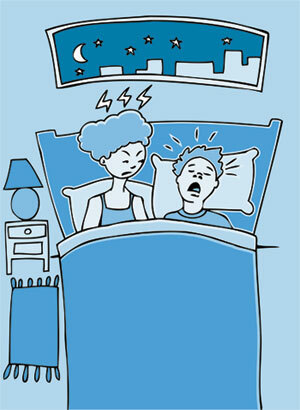 Snoring can cause sleepy days, morning headaches, and irritability. It can make it difficult for you to concentrate and can disrupt your sleep, and that of the people who sleep next to you. The National Sleep Foundation estimates that 90 million American adults snore, 37 million of them on a regular basis. About 40% of adult men and 24% of adult women are habitual snorers. Believe it or not, snoring appears to run in families, and it becomes more common as you get older. If you sleep with someone who snores, you know all too well what it is and what it sounds like. But what causes snoring, can it be treated, and do any of those “anti-snoring devices” on the market actually work? When you sleep, everything relaxes including the muscles of your throat and your tongue. Your throat becomes narrow and “floppy” and, as you breathe, the walls of your throat vibrate, causing that harrowing snoring sound. The narrower the airway becomes, the greater the vibration and the louder the snoring. Sleeping on your back may make you more likely to snore. If your throat muscles are hyper-relaxed from the use of alcohol or other depressants, snoring will worsen. Congestion from a cold or allergies can also cause snoring. Excessive weight: People who are overweight, obese or pregnant can have extra bulky tissue in the throat that causes snoring. Genetics: Family history may play a role in snoring as well, causing extra throat tissue, as well as enlarged tonsils, large adenoids or a long soft palate. Clogged airways: Allergies, congestion, colds and obstructed nasal passages can cause snoring. A deviated septum can prevent proper breathing through the nose while sleeping. The flu can clog airways and cause you to breathe through your mouth which may cause you to snore. Drugs and alcohol: If snoring occurs when the throat and tongue relax naturally, imagine what can happen if drugs and alcohol relax the body even further. Alcohol, muscle relaxants, some prescription medications including anti-anxiety drugs and sleep medications, and any drug that relaxes you, can cause snoring. The effects of smoking for many years can also relax the throat and tongue muscles. Yes, it can. When you see your ENT doctor about snoring an assessment will be conducted including a complete medical history that also asks for information on how long you have been snoring, any recent weight gain or changes in activity. You will need to give information on past and present drug and medication use and average alcohol intake; these factors can cause snoring. If your ENT doctor suspects that your snoring is caused by sleep apnea, a sleep study may be recommended at a sleep lab or at home. If sleep apnea is not an issue, there are many treatments for what is considered “ordinary” snoring. You may be surprised to learn that some of the most effective treatments for snoring are neither medical nor surgical. Dr. Donald Sesso says that the most effective treatments for snoring are lifestyle changes. The things you have the most control over can help to reduce snoring such as losing weight, maintaining a consistent sleep routine, not eating before bedtime, and eating a healthier diet. Weight loss can help reduce or eliminate snoring for some people. Excessive weight around the neck area will press on the throat while lying flat in a sleeping position, restricting the airway. If you sleep on your back, changing position may reduce your snoring. Dr. Sesso says that adjustable beds and pillows are simple fixes for changing your sleep position and are recommended for those who snore. Don’t drink alcohol three to four hours before bedtime. Be very cautious with the use of sedation and anti-anxiety medications. Certainly, take them as prescribed by your physician, but they may be contributing to your snoring. Consult with your physician or ENT doctor first. Custom fit oral devices from your dentist may also help to reduce snoring by keeping constricted airways open. These appliances look like a sports mouth guard and prevent the airway from narrowing while you sleep. There is no shortage of anti-snoring devices on the internet. One quick search displayed no fewer than twenty of them, all promising to “eliminate snoring,” or to “reduce snoring with the first application!” or promising that you’ll “stop snoring immediately upon use.” Dr. Sesso warns against spending your money on most of these devices because they are unlikely to give you the satisfaction you’re seeking. Instead, it is best to consult a certified ENT doctor like Dr. Sesso who can look at the physiology of your airways, assess your sleep and discuss your lifestyle habits with you. Together, you can address your snoring, improve your sleep, and your quality of life.